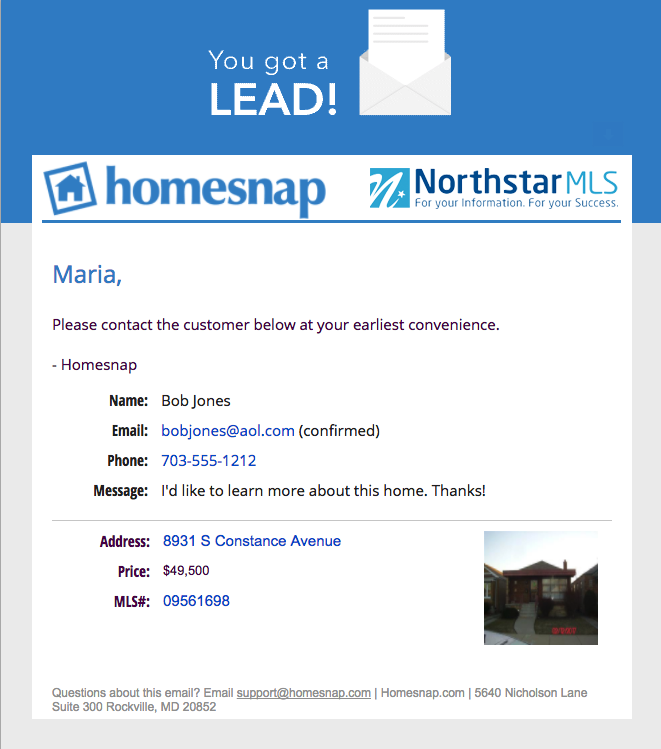 The Homesnap Pro mobile MLS app is available as a free core service to all NorthstarMLS subscribers. Available for download for iPhone, iPad, Android smartphones and tablets. Access to all NorthstarMLS data fields for all listings, just like in the regular desktop version of NorthstarMLS Matrix. Your own customizable agent profile viewable by other agents, clients and consumers. All product features, including Quick CMA’s and more. Invite your clients to the app which gives them the client version described below, tied to your profile and branded to you. Any consumer invited by a NorthstarMLS agent will have a special client version with the same data that can be accessed on any broker IDX website. Tied and branded to the agent who made the invitation. Download the Homesnap Pro app for your smartphone and claim your profile today! Invite your clients to download and use the consumer version of the app, too. Check out the Homesnap Pro University page loaded with educational content that you have access to. Everything from tutorial videos, recorded and live webinars (free live webinars every month), printable materials (PDFs, etc.) and more. To take a closer look at the features of Homesnap Pro to see how it could be beneficial to your real estate business, check out our handy NorthstarMLS Mobile Comparison Chart. We are proud to announce that the consumer version of Homesnap, Powered by the Broker Public Portal, is now available to buyers and sellers who are now going to national real estate portals. The Broker Public Portal (BPP) initiative grew out of a movement among brokers across the country to develop an industry-controlled real estate search experience for consumers. The idea was to leverage the relationship between brokers and their agents with the MLS where they list and sell property so that agents could deliver the highest quality listing information directly to buyers and sellers. NorthstarMLS was at the forefront of this national collaboration between brokers and MLS’s. Homesnap is the business and technology partner chosen by the Broker Public Portal Board of Managers to realize its goal of providing agents with an alternative to the big portals. It is a Mobile-first solution that has already achieved extraordinary adoption on a national basis both by agents who can engage with their clients and prospects using Homesnap Pro and directly by consumers who have made Homesnap the #1 rated real estate app in the App store. The BPP's choice of Homesnap as its public-facing partner has been a resounding success, with over 100 MLSs representing over 800,000 agents now displaying their listings. The BPP's goal of a national footprint has become a reality. You won’t find any advertising on the app, nor will you be sold premium placement or zip codes. This is a “your listing – your lead” service that is provided to you as a benefit from your MLS. Buyers and sellers will see all the homes for sale from every real estate company in our markets updated at the same frequency as IDX and with the same levels of quality and accuracy that are the hallmarks of MLS. We believe that Homesnap, Powered by Broker Public Portal, will be especially appreciated by consumers for its superior content and direct connection to you, the real estate professional best able to help them with their buying and selling needs. For any other Homesnap news that you may have missed on the Matrix News Screen >>> Click Here!